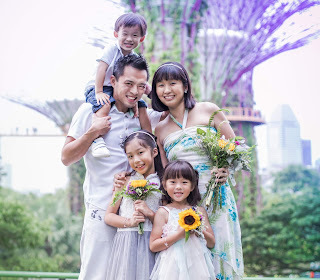 As a stay-at-home mum blogger, I always have readers asking me how I manage to do the household chores with three kids and no helper. 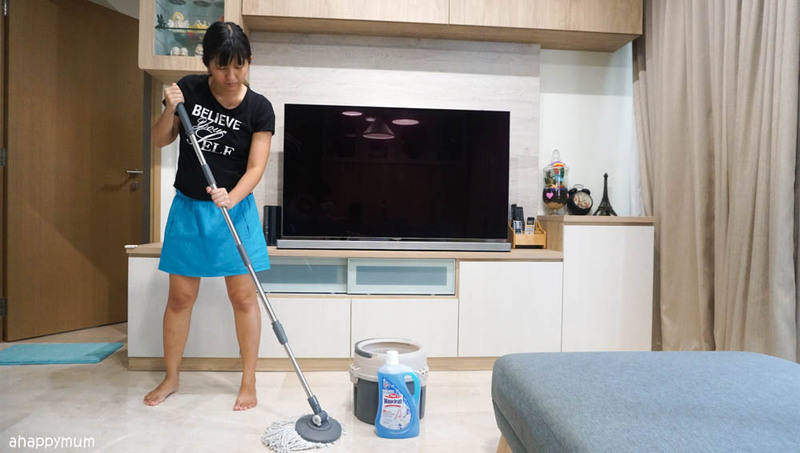 Some people mistakenly believe that we might have a part-time cleaner, which we don't, and some assume that we get some form of help from our parents, especially the in-laws who stay next door. The thing is, my parents don't come over at all unless we invite them over for meals. Otherwise, we are the ones who bring the kids out to meet them on some weekends. As for the in-laws, my father-in-law goes out in the morning to the brother-in-law's house to look after the grandchildren and returns late at night, while the mother-in-law works and is out half of the day. Even when she is home, she stays in her unit to unwind and watch TV so even though the kids might go over to talk to her for a while, we don't bother her with any of our chores. By the time the in-laws come home, which is past 9pm, the kids are already getting ready for bed and we would have gotten by another day. Yes, that essentially means I do all the laundry, cooking, grocery shopping, washing, cleaning, tidying, fetching from school, sending for enrichment classes, cleaning of dirty bums from day to day in addition to looking after the three kids myself. The only chore that I get help in is ironing and I really thank the father-in-law for that extra bit of help. As for the hubby, he is a very hands-on dad and a way better chef than I am. The only problem is being a navy commanding officer, he works very late and is rarely home on weekdays. Still, he drives the big girl to school in the mornings and tries his best to reduce my load during weekends. While his late working hours make me a tad relieved that I can usually keep our family meals simple, it also means I don't get help even from my spouse on most days. So, just how do we survive with the endless chores? Today, I'll be sharing with you some of my secrets as well as how we tackle one of the dreariest yet absolutely crucial chores - CLEANING. Just so you know, I am not a clean freak but I try our best to keep our house relatively clean and safe because that's important if you don't want the kids to fall ill. As as a mum, one of the worst things to handle is a sick child, or worse, a few of them. Unless you chase the kids out of the house, if not you will likely have to live with some kind of mess on a constant basis. Unmade beds, messy tables, scattered toys, stained walls - these are some of the things I've made peace with and even though I still nag at the kids to pick up after themselves, chances are we will never be able to live in a perfectly clean, immaculate house. Some people might see it as child labour but I see it as educating the kids to be responsible from a young age. Yes, I let the elder two help me out with the chores nearly every day and while it's not like they never whine about it, at least they're starting to accept it with more willingness than they did initially. It's the best way, or in fact the only way, we can make ends meet without a helper. I don't reward them for a job well done because I want them to see chores as a responsibility, but we do try to make it fun and more of a family bonding time than a dull routine. Make sure that you have all the tools you need and stock up on your supplies when they run low. Before we shifted into our new house this year, one of the first household items I brought over was a mop. Yup, I really wanted us to start on a 'clean' note and make the house ready for the kids. 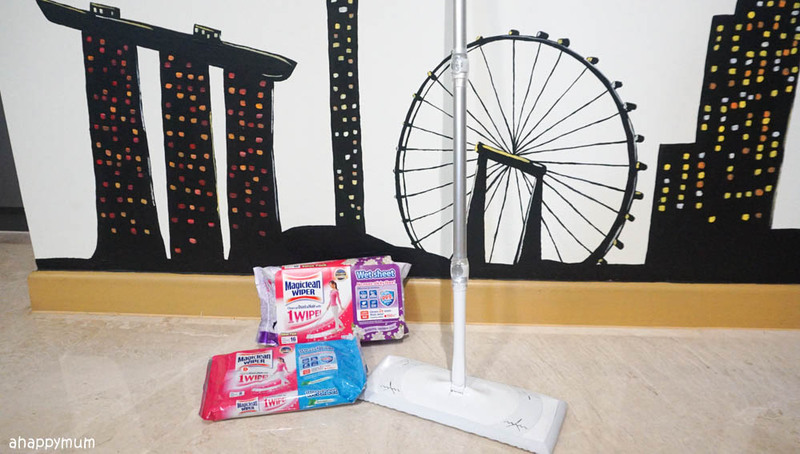 To make cleaning faster and easier, I also make sure I have ample supplies of cleaning products which I use and trust. If you remember, Angel contracted HFMD last year while Asher had two episodes of pneumonia. Those were terrifying, arduous ordeals and it pains my heart like no other to see my kids suffering. Yes, it's truly no joke when the kids fall sick and it gets worse if they start spreading the germs to one another. 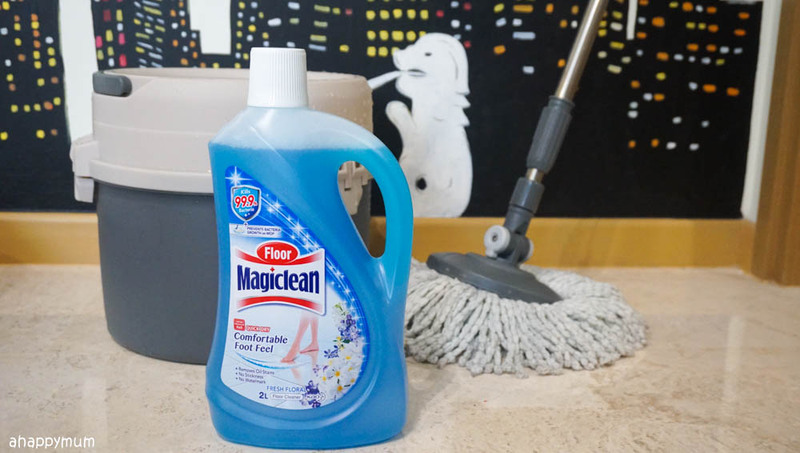 In wanting to keep my kids as healthy and as safe as possible, I choose to use cleaning products which have anti-bacterial properties and so far, Magiclean's cleaning range has been working well for us. Here's a look at the products that we've been using. 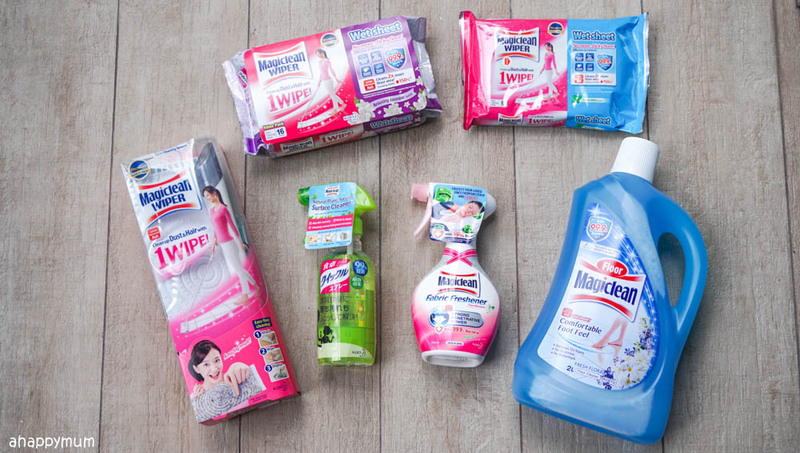 Yes, these are our must-have products in the Magiclean anti-bacterial cleaning range. I'll share a little more about each of them below. I'm always amazed by how much smoother and comfortable the floor feels after a mop, even if it's a quick one. For me, I like a floor cleaner that doesn't need rinsing, gives off a nice fragrance and dries quickly without stains or stickiness - there's a high chance that one of the kids will fall when the floor is wet. The Magiclean Floor Cleaner not only removes sticky dirt and oil stain, it also dries fast and kills 99.9% of bacteria. Having six fragrances to choose from is a plus point and we love the lingering scent of the Fresh Floral fragrance that we are using. 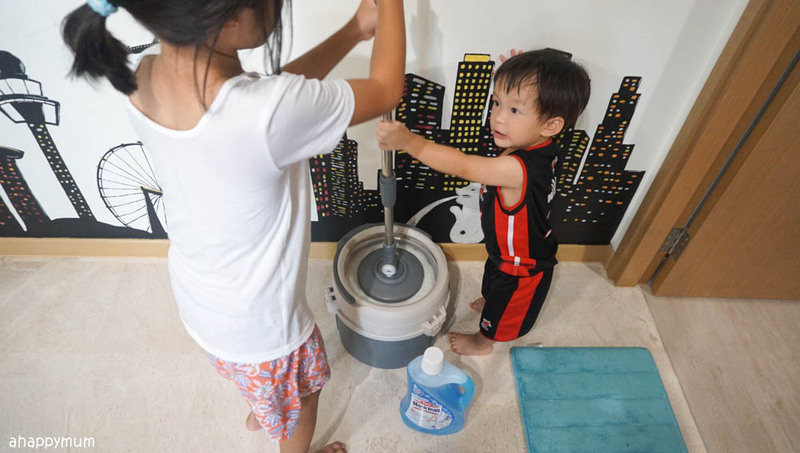 How my kids help: While I still do most of the mopping because wet, slippery floors are too much of a hazard, the kids can help me to measure and pour the cleaning liquid as well as soak and spin-dry the mop. You have to let them start somewhere, right? After writing that last part, I think I should first clarify that I DON'T MOP the house every day. Seriously, where got time? In fact, this might make your jaw drop but if we don't have visitors to the house, I only mop the floor every weekly. Or even fortnightly. Ah-huh. Before you go "Oh gosh, this house must be so dirty! ", let me introduce you to one of our favourite products - the Magiclean Wiper and Wet Sheets, which we turn to every couple of days. 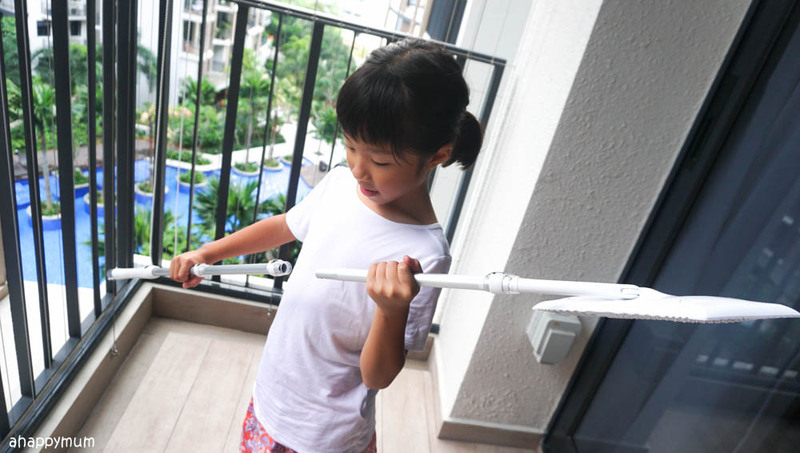 The Wiper is so easy to assemble that my big girl can do it on her own. 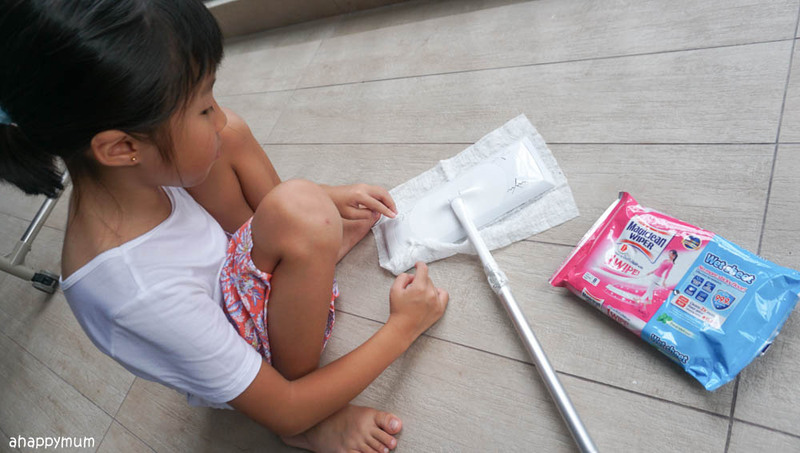 It works as a makeshift mop for us and make things so convenient because you don't have to carry a bucket of water around the house. Plus, once you are done, all you need to do is dispose the wet wipe and... that's it! One thing I like about the Wiper is that having a 2.8cm thin mop head makes it easy for you to reach narrow spaces, for instance under the sofa which always gathers a lot of dust in our house since it is right beside the balcony. You can also turn the mop head so as to maneuver around corners easily. How my kids help: From assembling to wiping, the big girl is usually up for the task and she sees it as a fun activity too, which is a win win for both of us. Even though she takes double the time of what I use to clean the house, I'm just glad she is trying hard. Once, I even saw her putting on a N95 mask herself and went around cleaning the house. How cute, right? Let's face it. There are a handful of fabrics that I don't wash as often as I would have liked because it is simply too much of a hassle. These include the sofa, cushion covers, curtains, stroller seat, bean bag covers and bedsheets too. After moving into the new house, I make sure we always have a fabric freshener in the house because you just never know when you might need it. 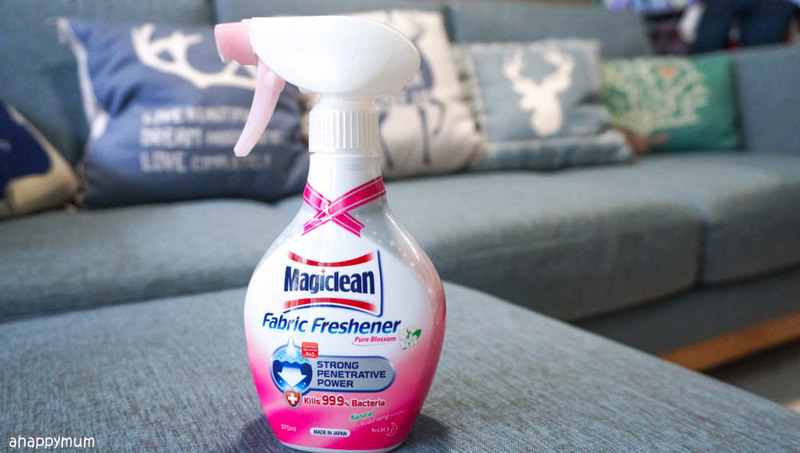 The Magiclean Fabric Freshener helps to penetrate into the fabric fibres and is proven to kill 99% of flu virus and bacteria. There are also natural deodorizing extracts which help to remove odours too. A quick spray on places like the sofa and bed definitely helps to make us feel better, safer and more refreshed. How my kids help: This task, being one of the easiest and fun ones, belongs to the little sister. She handles the bottle with ease and loves spraying so much that I have to tell her when to stop. Then, she makes it a point to go around the whole house finding fabrics to spray and will ask me for permission first before she does. Awww. Last but not least, this is something that we've only started using recently but love it nonetheless. 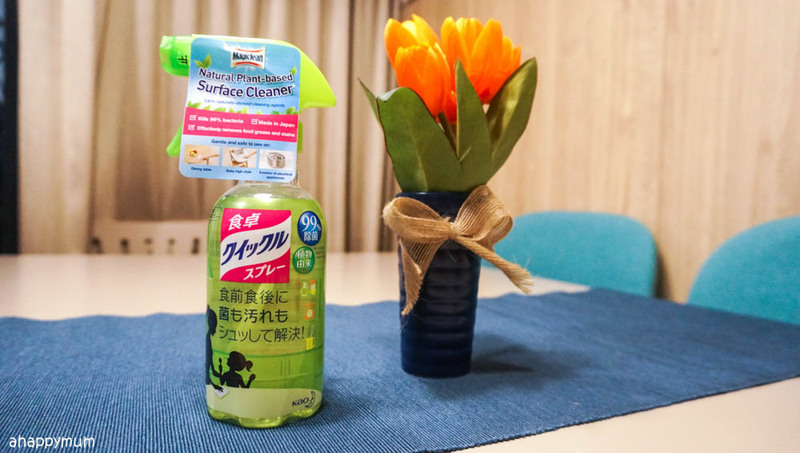 Manufactured in Japan, the surface cleaner is a new limited edition product from Magiclean and is made with 100% naturally-derived cleaning agents. Not only does it help to remove grease, stains and finger marks, it also kills 99% of bacterial and helps to keep my house clean and my kids safe. I often tell my kids to beware of many household products because of the harmful chemical ingredients. 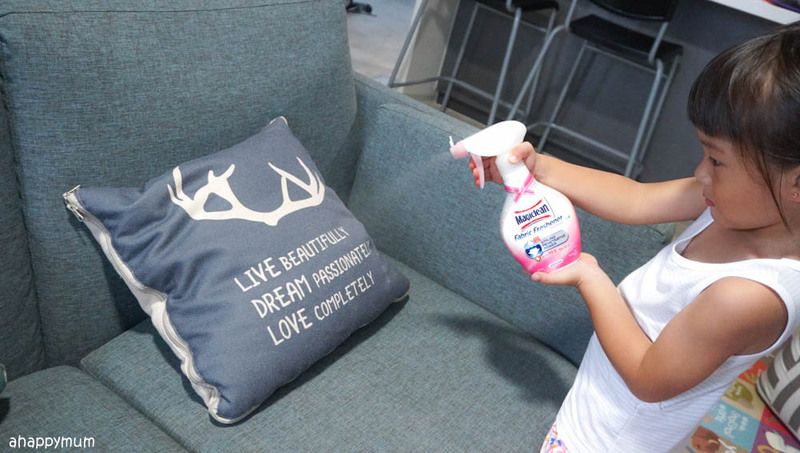 Knowing that this plant-based cleaner is made with natural cleaning agents makes me feel relieved and keeps my mind at ease, considering that the kids are in contact with many of the cleaned surfaces. Moreover, it makes me feel comfortable letting them handle this cleaner on their own too! To use it, all you need to do is spray and wipe with a clean cloth or tissue. 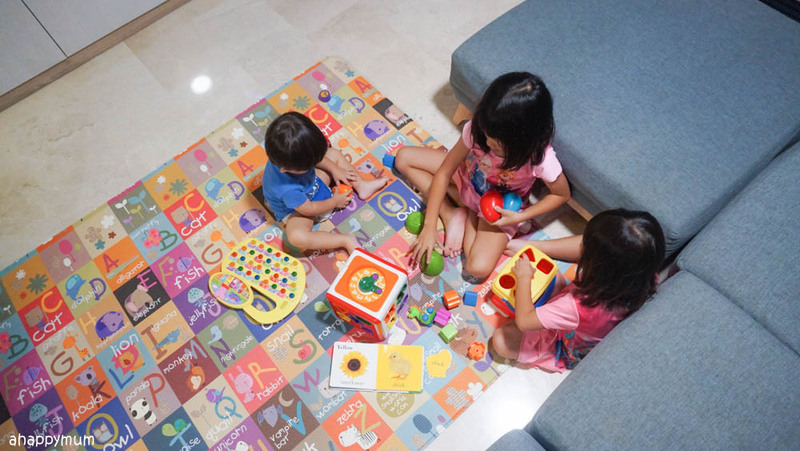 It can be used on surfaces like the dining table, kitchen table, baby chair, windows, mirrors, furniture and even toys and electrical appliances. Yes, so previously we had a solution for fabrics and now we have a cleaner for the non-fabric surfaces. Yay! How the kids help: Easy, all I need to do is give them some clean cloths and ask them to start cleaning - usually the dining table, kitchen top and their study tables! I don't let them deal with electrical appliances yet for obvious reasons, but if they are in the 'cleaning mood' and wish to do more, I just let them spray and wipe away. It's not that I can relinquish my cleaning duties as a mum and the fact is I still try to get things done in the mornings when the girls are in school and I am left with only one kid. However, we've really seen marked improvement this year and both of the girls have stepped up to their plates and shown better attitudes in taking responsibility, procrastinating less and doing their part to help out in the house. 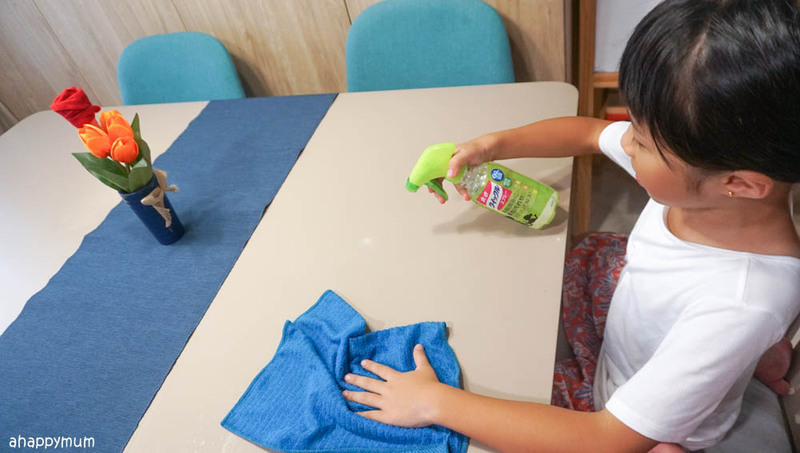 In fact, cleaning is the one chore which we've seen the most progress because it comes easy even to kids and can be a fun activity to do too. Yup, whether the floor is squeaky clean or not, it doesn't matter so much, right? So kudos to you, kiddos! As for now, it's been a blessing to know that except for a couple of minor coughs, which we let heal on their own, the kids have been well since the start of the year and unlike last year, we've not made a single trip to the hospital or even the clinic. *victory dance* I'm keeping my fingers crossed that things will stay this way for a long time and you bet we'll continue with our routines and rely on our trusted cleaning products to help build a safe family haven. Magiclean’s anti-bacterial cleaning range is available at all leading supermarkets, hypermarkets, minimarkets and provision shops. 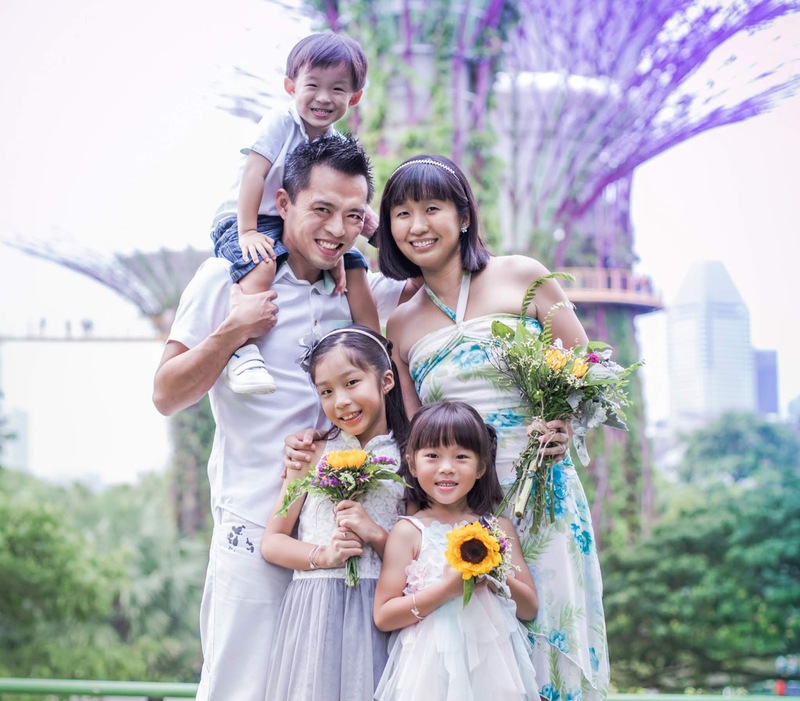 For more product information, visit www.magiclean.com.sg/protectyourfamily. Disclosure: This is a sponsored collaboration between Magiclean and A Happy Mum. All opinions are purely my own.